In the same way that I hear Ford and think of cars or hear Maytag and think of appliances, when the name Avon comes up, I think of makeup and skincare. Because, right? Avon has been known for decades for their lipstick and blush, so that's what I've always associated with the brand. So you can imagine how surprised I was when I realized that Avon, the company for women, is the world's largest direct seller and offers items for men, children, the home, jewelry, hair care... the list goes on and on! Where have I been that these great products have been offered all over the world (there are more than 5 million independent Sales Representatives in 100 countries!) and I am just now realizing the vast array available? Fortunately, that has now been remedied. I can now say that, as this summer is the perfect time for women everywhere to spruce up their wardrobe with fashionable and affordable pieces, Avon is just the company to help us do it. With so many ways to be stylish and trendy for women of all ages and body types, Avon has the large selection, flattering options, and great colors that are just what works for summer. 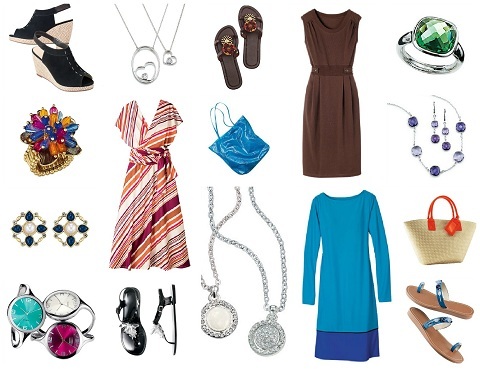 From dresses to jackets to handbags to accessories to footwear, everything you are shopping for is all in one place! When a large box containing a variety of gorgeous Avon products arrived, I barely had to look inside before I was immediately taken with the fabrics, colors and decorations. 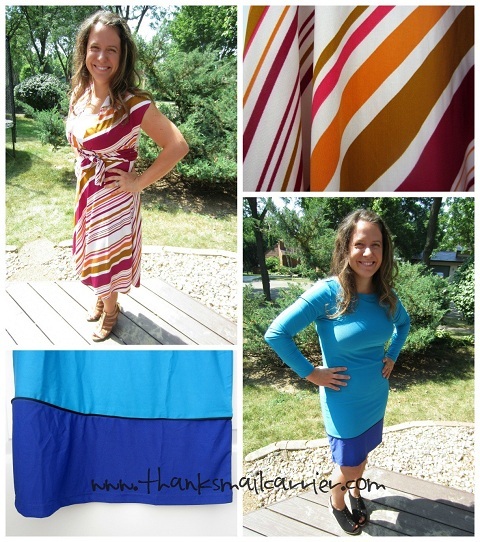 With the Striped Convertible Dress, Bright Banded Dress and Side Tab Dress in my closet, there aren't too many places that I would be going that one of these three wouldn't be the perfect choice. The colors, the trends, the versatility — I was eager to add multiple occasions to my calendar so that I would have reason to wear each of them! Right away I enjoyed the way that the Polyester and Spandex combination in the Striped Convertible Dress and the Bright Banded Dress provide just enough stretch that they fit comfortably, yet they don't cling. They can both be machine washed and dried (a must!) and are bright and colorful for summer. The Bright Banded Dress fits right in with the color-blocking trend that is in every catalog and department store! The Striped Convertible Dress was slightly intimidating to me at first, as I wasn't exactly sure what to do with the two long straps that make up the top. However, with one click on the "Watch The Video" button right on Avon's website, I was shown clear instructions as to how to turn this single dress into SIX different options! Whether I'm in the mood for a halter, strapless, one shoulder or more, this great versatile dress can do it all! The Side Tab Dress is a great piece to have in my wardrobe, as it is soft (100% cotton), comfortable and has just the right amount of detail in the pleats and tabs to give it style. The neutral color pairs well with just about any jewelry and shoes and can easily be dressed up or down depending on the occasion. It is just all too easy to pull this out and be prepared for anything from going to the library or heading out to dinner! While each of these dresses look as though they could easily have high price tags, the Bright Banded Dress and the Side Tab Dress retail for only $24.99... and the Striped Convertible Dress, which is usually $29.99, is on sale now for only $19.99! But what is a dress without the footwear and accessories, right? Being the shoe person that I am, I loved seeing a variety of styles that Avon has to offer, as it was clear that they have everything from casual to fancy that can work with just about any outfit. For an extra lift for a special occasion, the gold gladiator-style sandals (no longer available on the Avon website, but somewhat similar to these) are completely different than what I usually wear — but much more fun! The suede feels soft and smooth and the zipper on the back makes them extremely easy to put on and off. They're quite high but they're just so very cool! For a slightly more toned-down look, the Slingback Zig Zag Wedge are an eye-catching way to add fashion to the typical wedge. The white stitching down the front contrasts well against the black faux-suede upper and the 3⅛" heel height is made comfortable with the cushioned arch support and elastic strap to keep your foot securely in place. When it comes to sandals, Avon has plenty that have a little extra something to stand apart from plain flip flops that are found in store. The Beaded Flat Sandal are embellished with just enough beads and faux stones that they have an exotic flair to them, while the slight cushion in the footbed ensures their comfort. At the same time, the Beaded Toe Loop Sandal has a unique look with the single loop over the big toe and over the top of the foot. I hadn't expected to like the way that it feels to have a strap going all the way around my toe, but I found it surprisingly comfortable and easy to wear. Add in the touch of sparkle with the beads and these blue sandals are fashionable and fun! But for a glittery twist to your outfit, the Clear Beaded Jelly are just the thing to add some glitz and glamour. While the molded jelly shoe itself doesn't provide quite as much support for my foot, the clear bead accents are an attractive way to spruce up traditional black sandals. Retailing between $19.99 and $34.99, I was happy to find that Avon's footwear fit true to size (they suggest ordering up if you typically wear a half-size), making it worry-free to order online. They truly have shoes and slippers that will work for every personality and taste! Along with footwear, Avon has fashionable handbags that are appropriate from day to evening or just for grabbing and heading to the beach! The Hawaiian Shores Tote Bag (regularly $19.99 but on sale for only $12.99!) 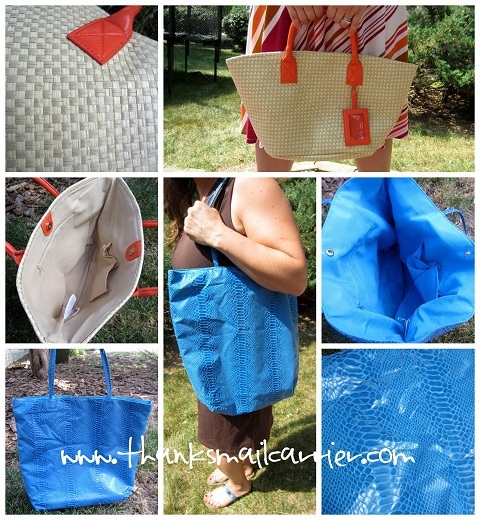 has a lightweight feel and the look of straw but is fully lined with coordinating fabric on the inside. The addition of the fun orange handles and ID tag complete the outer look, while the three inner pockets (one zipper and two slip pockets) provide organization. The magnetic snap closure keeps all of my items secure whether I'm holding this bag in my hands or in the crook of my elbow. Or, for a slightly larger ( 17¾" W x 15½" H) bag that can easily go along with you anywhere, the Snake Print Tote Bag features faux snakeskin that gives a bright pop of color in blue, fuchsia or yellow. This bag retails for $29.99 and has a soft feel and just enough shine to catch the light! 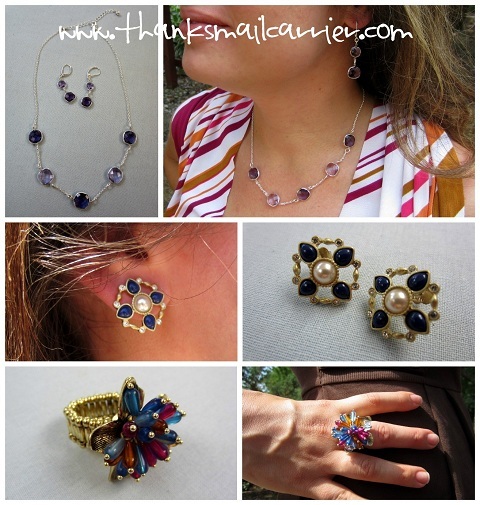 Finally, what would summer outfits be without jewelry? The Stylish Cuff Watch ($29.99) is available in three colors and two sizes for a classic, attractive way to tell time. I received the Silver design in size Large and found that it was indeed quite big, providing a feel similar to a bangle bracelet. I love the oversize face of the watch, as it gives a clean, easy-to-read look that can be seen at a glance. 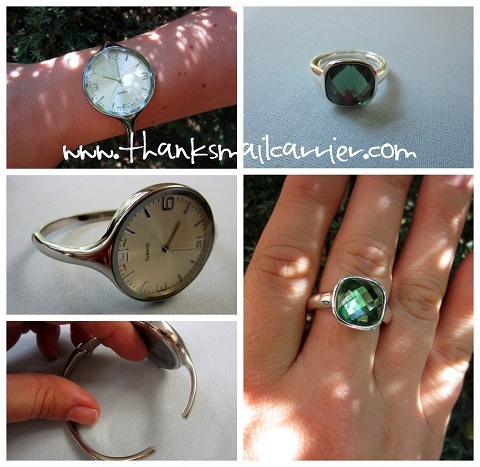 For a similarly simple-yet-stunning piece, the Harbor Lights Ring ($19.99) is large and dramatic as the colorful faux stone and the shiny silver band work well together. This ring is also available in three colors and three sizes and I found that the Green is shiny and clear but that the Large is too loose for all of my fingers. But I love the look! Taking the colorful, jeweled look of the Harbor Lights Ring even further, the Harbor Lights Necklace and Earring Gift Set ($19.99) comes in blue, green or purple and combines an adjustable necklace (it even comes with an extender so that you can really customize the length) and 2" pierced earrings. I found that the combination of the silver and the purple really made a subtle yet beautiful combination! For a more traditional look, the Color Embellished Earrings have just enough sparkle and shine in the beads and faux pearls that they look expensive... but retail for only $7.99! These are a great little pair of earrings to go with everything from a dress for the evening to jeans and a tee for the afternoon. Alternatively, for a colorful statement piece, the Hawaiian Shores Ring stretches for a personalized fit that is sure to turn heads. The bright blue, pink and orange beads are a perfect summer accessory for adding a contemporary kick for only $9.99. Finally, I love jewelry that is versatile and the Nesting Hearts Charm Necklaces and the Celinda Reversible Pendant Necklace are just that. The Nesting Hearts Charm Necklaces ($14.99 for both) can be worn separately or together — or share one with a loved one so that you each have them! 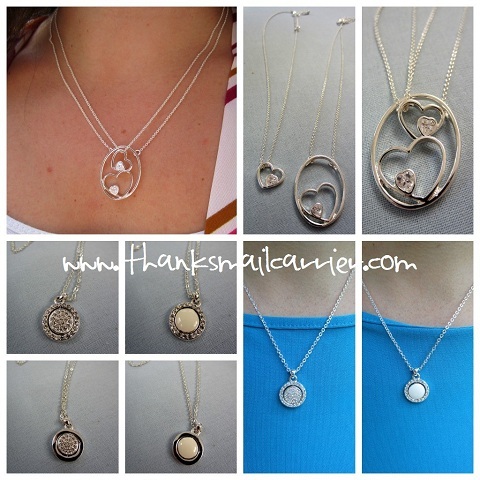 Each of the silvertone necklaces features a heart with a rhinestone accent and reminds me of a mother-child symbolic set. This double-sided silvertone disc of the Celinda Reversible Pendant Necklace hangs perfectly on its chain and can be rotated to end up with a total of four different looks. Combine the rhinestone pavé with rhinestone pavé, the rhinestone pavé with the shiny enamel, the smooth silver with the rhinestone pavé, or the smooth silver with the shiny enamel. Depending on what level of bling your outfit needs, this necklace does it for only $14.99. With everything from fashion to skincare to jewelry to makeup to items for the home, children, men, women and more, Avon has it all (with affordable price tags)! On top of that, they have continued to strive to best understand and satisfy the product, service and self-fulfillment needs of women globally. Their dedication to supporting women touches not only beauty—but health, fitness, self-empowerment and financial independence. Whether you are buying or selling, you'll want to head to Avon's website and connect with them on Facebook and Twitter so that you don't miss the latest and greatest from this classic company... and see how they can provide the perfect items for your wardrobe this summer!